When (and not if) the next recession comes, monetary policy is likely to face a hard problem. For most of the last few decades, the standard response of central banks during a recession has been to reduce the policy interest rate under their control by 4-5 percentage points. 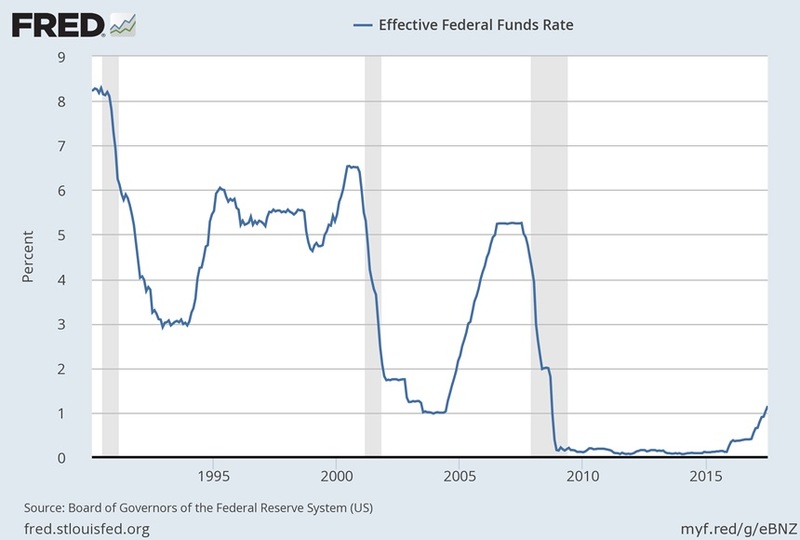 For example this is how the US Federal Reserve cut it interest rates in response to the recessions that started in 1990, 2001, and 2007. The problem is that when (not if) the next recession hits, reducing interest rates in this traditional way will not be practical. 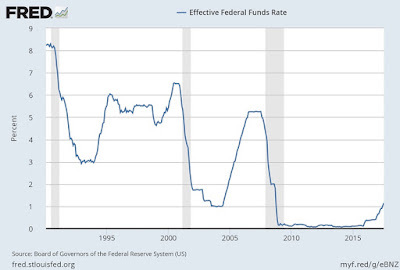 As you an see, the policy interest rates has crept up to about 1%, but that's not high enough to allow for an interest rate cut of 4-5% without running into the "zero lower bound." The problem of the zero lower bound seems unlikely to go away. Nominal interest rate can be divided up into the amount that reflects inflation, and the remaining "real" interest rate--and both are low. Inflation has been rock-bottom now for about 20 years, even as the economy has moved up and down, leading even Fed chair Janet Yellen to propose that economists need to study "What determines inflation?" Real interest rates have been falling, and seem likely to remain low. The Fed is slowly raising its federal funds interest rate, but there is no current prospect that it will move back to the range of, say, 4- 5% or more. Thus, when (not if) the next recession hits, it will be impossible to use standard monetary tools to cut that interest rate by the usual 4-5 percentage points. What macroeconomic policy tools will the government have when (not if) the next recession hits. Fiscal policy tools like cutting taxes or raising spending remain possible, although with the Congressional Budget Office forecasting a future of government debt rising to unsustainable levels during the next few decades, this tool may need to be used with care. Hitting the zero bound is why the Fed and other central banks turned to "quantitative easing," where the central bank buys assets like government or private debt, although this raises obvious problems of what assets to buy, how much of these assets to buy--and the likelihood of political intervention in these decisions. 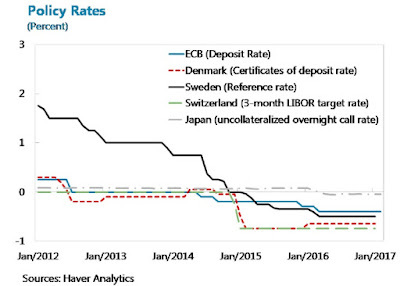 Thus, some central banks have taken their policy interest rates into negative territory. As the figure shows, the Bank of Denmark went negative in 2012, while a number of others did so in 2014 and 2015. "There is some evidence of a decline in loan and bond rates following the implementation of NIRPs [negative interest rate policies]. Banks’ profit margins have remained mostly unchanged. And there have not been significant shifts to physical cash. That said, deeper cuts are likely to entail diminishing returns, as interest rates reach their “true” lower bound (at which point agents shift into cash holdings). And pressure on banks may prove greater; especially in systems with larger shares of indexed loans and where banks compete more directly with bond markets and non-bank credit providers. ... On balance, the limits to NIRPs point to the need to rely more on fiscal policy, structural reforms, and financial sector policies to stimulate aggregate demand, safeguard financial stability, and strengthen monetary policy transmission." For those who instinctively recoil from the notion of a negative interest rate, it's perhaps useful to remember that it has occurred quite often in recent decades. Any time someone is locked into paying or receiving a fixed rate of interest, and then sees inflation move up, a negative interest rate results. Thus, back in the 1970s and early 1980s, lots of Americans were receiving negative interest rates if they had money in bank accounts or Treasury bonds, and were paying negative interest rates if they already had a fixed-rate mortgage. In short, the innovation here isn't that real inflation-adjusted interest rates can be negative, but rather that a nominal interest rate is negative. It's also worth remembering that this policy interest rate is related to the everyday interest rates that people and firms pay and receive, but it's not the same. The interest rates for borrowers, for example, are also affected by underlying factors like risk and collateral. In short, negative policy interest rates does mean downward pressure on interest rates, but it doesn't mean that the credit card company is going to be paying you if you charge more on your credit card, or that negative interest will start eating away your home mortgage. Thus, the existing evidence on negative interest rates to this point show that having the policy interest rate be a few tenths of a percent in the negative is possible, and can be sustained for several years. It doesn't show in a direct way how banks, households, and the economy would react if negative nominal interest rates became larger and widespread through the economy. "In most advanced countries, private agents are free to contract on whatever indexation scheme they prefer; this is not a condition that can be imposed by fiat. If the private sector does not convert to electronic currency, the zero bound would re-emerge since it still exists for paper currency. Finally, one must consider that after a period of negative interest rates, paper and electronic currency would no longer trade at par, which would be an inconvenience in normal times. Restoring par would require a period of paying positive interest rates on electronic reserves, which might potentially interfere with other monetary goals." Rogoff recognizes that negative interest rates raise a number of practical and economic problems, including issues of regulatory, accounting, and tax policy. But from his perspective, negative interest rates are the best of the alternatives when a central bank faces the problem of a zero lower bound on interest rates. For example, quantitative easing only seems to have mild effects, while exposing the central bank to political pressures about who gets the loans from the central bank. Re-setting the central bank inflation target from 2% to 4% might help push up nominal interest rates, and thus allow those rates to be cut in a future recession while remaining above-zero, but given that central banks have spent decades establishing their goal of 2% inflation in the minds and expectations of financial markets, such a shift isn't to be contemplated lightly. Looking at these and other policy options--like all countries simultaneously trying to weaken their currencies in order to boost exports--Rogoff argues that negative interest rates are the simplest and cleanest option, with the best chance of working well. From my own point of view, negative policy interest rates are one of those subjects that literally never crossed my mind up until about 2009. When the central banks of smaller economies like Denmark and Switzerland first used negative policy interest rates, but the main goal seemed to be to assure that the exchange rate of their currencies didn't soar. I wasn't quite ready to draw lessons for the US Federal Reserve from the Swiss National Bank or Danmarks Nationalbank. But when the Bank of Japan and the European Central Bank started employing mildly negative interest rates, and it seemed to be working without major glitches, it became clear that more serious attention needed to be paid. I remain dubious about interest rates in the range of negative 3-5%, but my reasons are less about technical economics and more about potential counterreactions. Back in the 1970s, people put up with the idea that the inflation rate was higher than the interest on their bank account or on Treasury bonds, but the nominal interest rates they received was still positive. Maybe the public in other countries would accept a situation in which their bank accounts were eroded by 3-5% per year by a negative interest rates, but I have a hard time imagining that this would fly in a US political context. In an economy where negative interest rates are common, I would also expect large financial institutions like pension funds, insurance companies, and banks to make strenuous efforts to sidestep their effects. I've reached the point where I'm willing to consider negative interest rates as a serious possibility, but I suspect that the practical problems and issues of substantially negative interest rates are at this point underestimated.